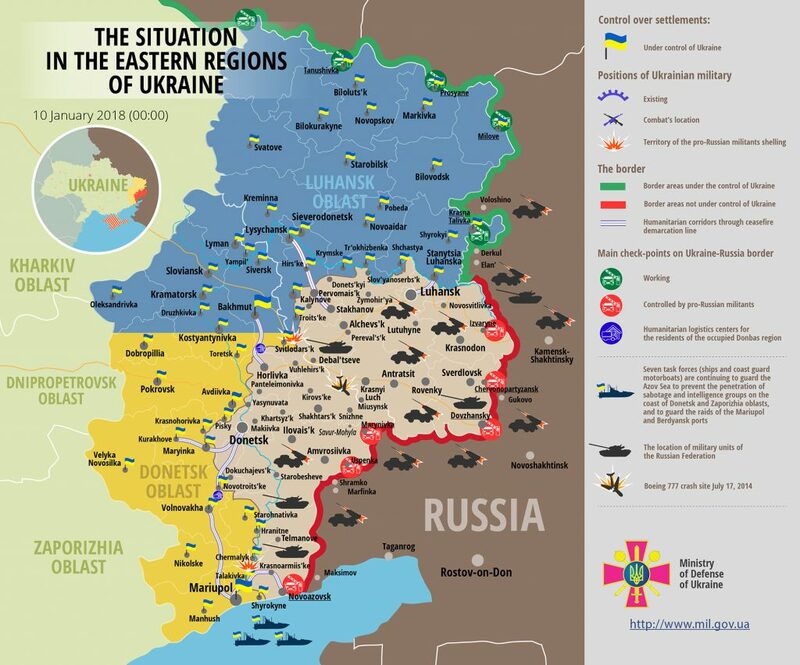 On January 11, Ukrainian Ministry of Defence reported increasing intensity of fighting and violation of the ceasefire negotiated by the Minsk accords. 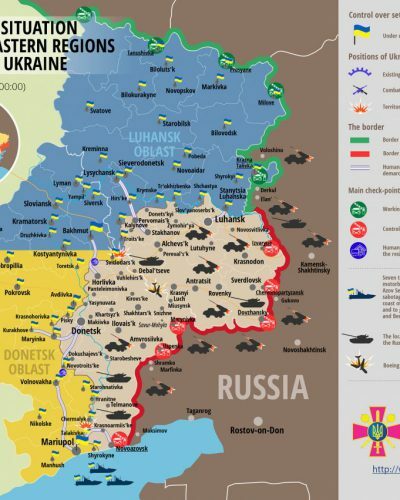 Three Ukrainian servicemen were killed in action. Incidents were recorded all along the contact line with Ukraine, but dominantly in the Svitlodarsk area. The militants used mostly small arms and mortars. As of January 12, nine additional ceasefire violations were reported. Ukrainian military spokesman Oleksander Motuzyanyk said that the separatist side is “more and more cynically and brazenly increasing both the intensity and density of its firing.” On the other side of the contact line, the rebel leadership accuses Ukraine of violating the ceasefire first. It remains to be seen how the situation develops in the next few weeks. After all, the escalation could just be a part of the natural ebb and flow of the conflict. Or it could be also connected to the recent changes in rebel leadership in Luhansk. In the early days of 2018, demonstrations took place in numerous cities in Tunisia, coinciding with the anniversary of the 1984 bread riots and the 2011 protests that resulted in the ousting of President Ben Ali, sparking the Arab Spring. The protests were ignited by calls for action on social media and the emergence of the “What Are We Waiting For?” youth online movement. Thousands of people looted and burned supermarkets and shops, as well as police stations. So far, one person has died, dozens were injured in the clashes and 800 people were arrested. Similar to the Iranian protests, the primary reason behind the protests is an economic hardship. Since 2011 the economic situation in Tunisia has been deteriorating: the currency lost 40% of its value against the U.S. dollar, unemployment is around 15%, the inflation hit 5,3% last year and the deficit was 6%. The government adopted a new reform that introduced austerity measures, such as taxes on luxury products, but also increased the value-added tax. This resulted in a widespread price hike, including vegetables and bread. In response to the protests, the Tunisian government announced programs to help the poorest families. Since the fall of Ben Ali, Tunisia had 9 governments, all of which proved incapable of dealing with the economic problems. To make things worse, the vital tourism sector still suffers from the decline of visitors after the deadly 2015 attack in Sousse. This instils the fear that the situation may spiral out of control. Korean ice melting at the Winter Olympics? The animosity between the two sides of the Korean Peninsula is a well-known fact since their armistice agreement in 1953. Both countries have failed in the political dialogue long time ago and technically are still at war. One of the lowest points in their relations came in 2015 when their last mutual communication channel has been disconnected. Since then, there has been only silence. However, the new year has already brought a change: both countries have united in the peace village Panmunjom to discuss the participation of the North Korean athletes in the Olympic Games in February 2018 in Pyeongchang. The possibility of an agreement has been announced by the leader of North Korea Kim Jong-un in his new year´s speech. South Korean women's hockey players are upset that they will be unified with North Korea. As expected, the meeting between both countries had a political turn. In addition to sports, the possible improvement of their cold relations was brought to the table. Issues such as military negotiations or the possible reunion of separated families have been discussed. After two years of a silence, this can be counted as definite progress. North Korea will send a delegation consisting of athletes, representatives of the national Olympic committee, journalists, fans and artists to the Olympic Games. South Korea has also offered the North the possibility to consider lifting some relevant sanctions during the games. Additionally, the South has suggested both countries should march together in the opening ceremony, as they did in Winter Olympics in 2006. But not all are impressed with the sudden U-turn in relations. Japan urged caution over the North’s “charm offensive”. They warn that North Korea has not given up the development of nuclear weapons capable of reaching the U.S. It is also suggested, that the warming of relations means, that the sanctions against the North Korean regime are working.